Whilst surfing the worldwide web I came across instructions for this charming and useful storage bag made from scraps of cotton fabric. The scraps are cut into strips measuring 1½ inches x 5 inches. The base of the bag is a single rectangle and then the lining is cut from a co-ordinating fat quarter. I needed only a small piece of wadding and the end result is a charming storage bag measuring 5 inches high x 5 inches wide x 3 inches deep. 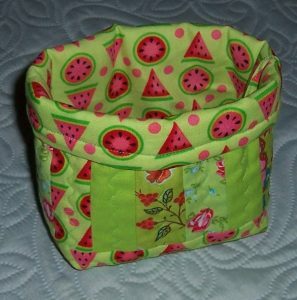 The bag is an ideal size for storing a variety of items or as a gift. For the next version I intend to increase the size. As I had originally intended to make window project bags for my friends for their Christmas gifts but with time passing at an alarming rate, they may eventually end up with versions of this storage bag. We are trying something new – short classes of 2½ hours which are graded according to skill level. There are classes for Beginners, Improvers, Intermediate and Advanced stitchers. The first classes will run on SEW SATURDAY which this year is Saturday 21st October. The morning will be for absolute beginners getting to know the basics of a sewing machine. 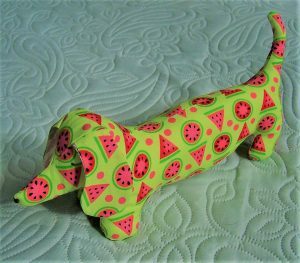 In the afternoon for more experienced stitchers we will be making Daisy the Dachshund pincushion which is the mascot for this year’s event. I made my first Daisy several years ago using some fine Pink needlecord. She has done great service but is now looking a little worse for wear. 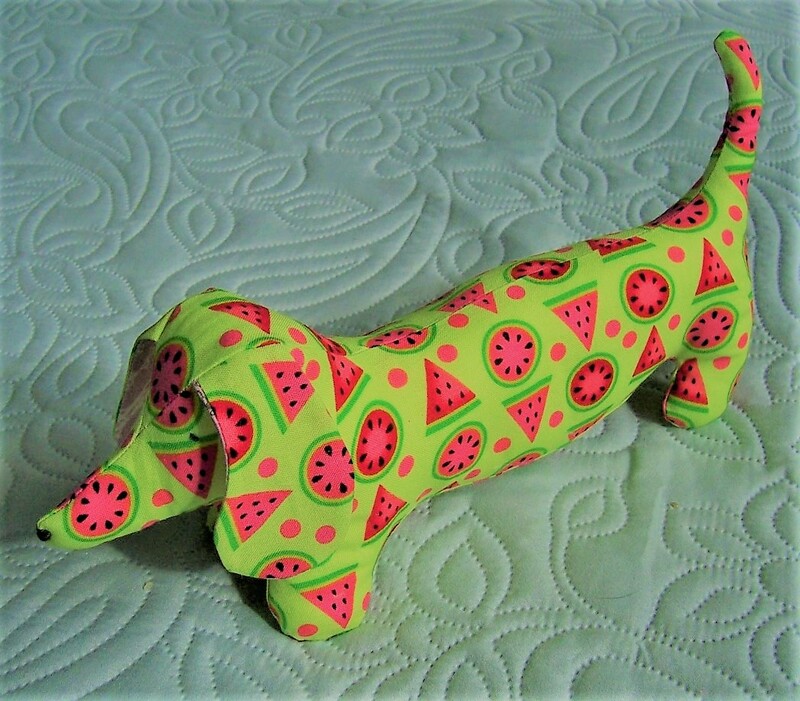 In anticipation of the class next month I made a new version using a charming printed cotton featuring Water Melons on a Bright Green background. 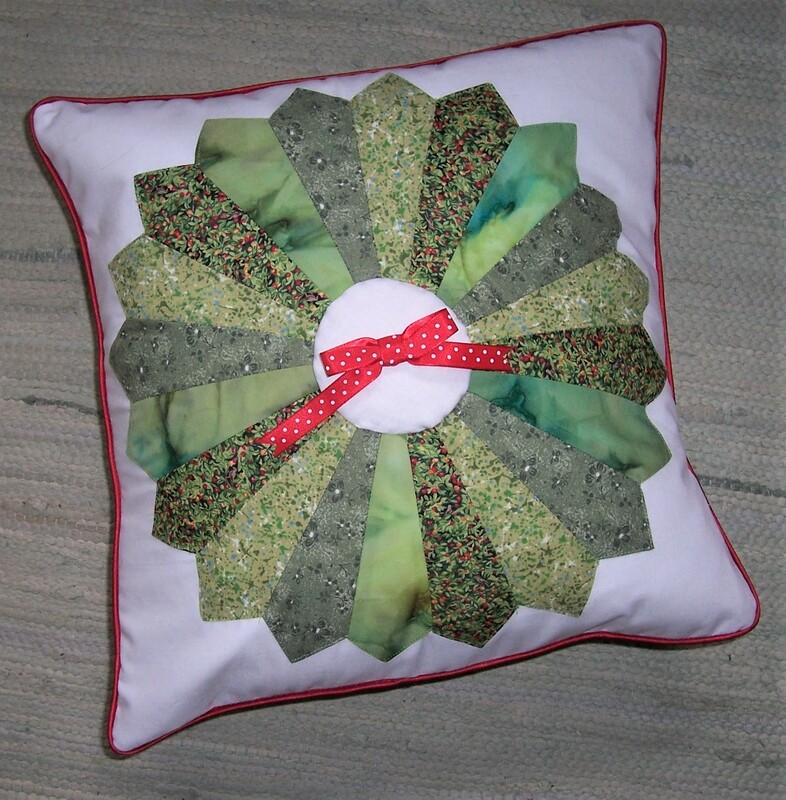 The pin cushion takes about half of a Fat Quarter of fabric and less than an hour to stitch. This is a relatively straightforward sew although there are 4 Y-seams to conquer when setting in the head gusset and the ‘undercarriage’ sections. The remainder of my time was taken up filling Daisy with polyester toy stuffing and embroidering the features. I have enjoyed making Daisy and envisage that she will make a charming gift for my sewing friends. OK, I promise this is the last Dresden Plate block for a while. However, I have scheduled in to teach a class for this lovely patchwork block so there will be a few more appearing next month as I prepare the class materials! None of these patchwork projects were in my September Sewing Plans and now I have only a few days left to complete what I should have been sewing! Outstanding are 2 dresses and covers for the chair in my sewing room. So far I have only managed to cut out one dress which will take a couple of afternoons of sewing therefore I will have to be philosophical and accept that none of my plans were set in concrete and it is of no great importance that the plans have changed. On to tell you a little about this particular version of Dresden Plate. I found a picture on Pinterest of a similar 20-blade block worked in shades of Green and finished with a dramatic Red Bow. 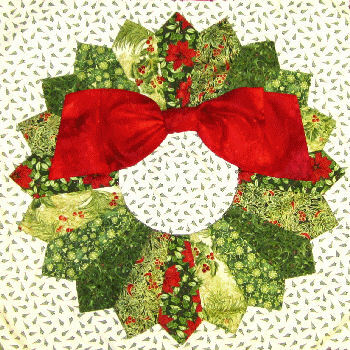 It looked like a Christmas wreath. As I could not decide on fabric for the large bow I have opted for a smaller version set on a well-padded centre. 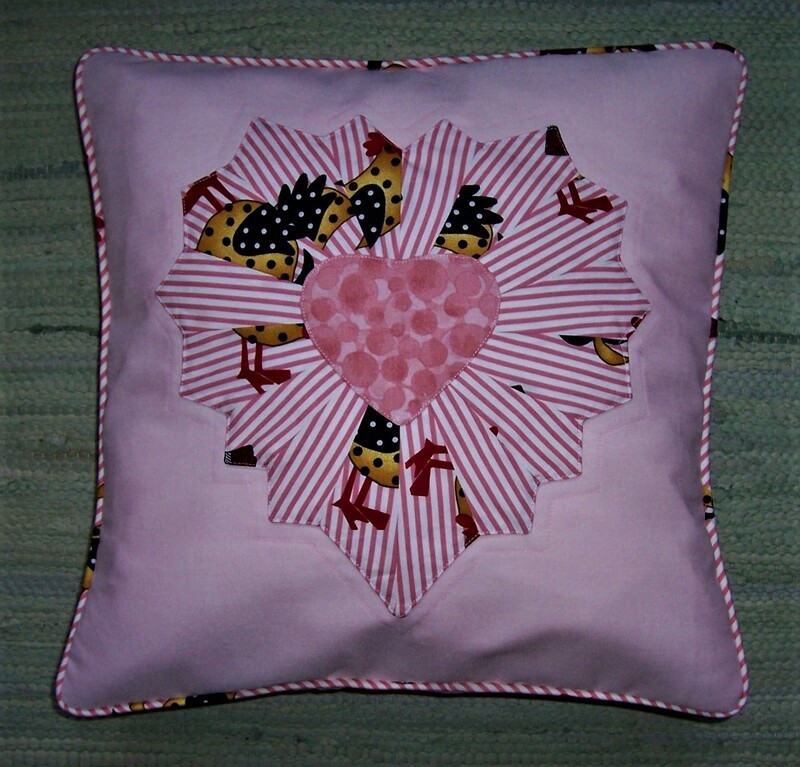 The cushion is piped with some ready-made Ruby Red satin piping and has an envelope closure on the reverse. The cover measures 15 inches square and is well-‘plumped’ with a 16 inch pad. I did say that I was hooked on the Dresden Plate block design! After a browse on the internet I found the pattern for this delightful 'Valentine' Dresden block free on the Craftsy.com website. I knew that I wanted to use stripes to radiate from the centre of the design and the only narrow striped fabric I could find in my stash was this 100% cotton which has been overprinted with some 'crazy' chickens. In the finished result I quite like the 'picasso-esque' nature of how the design has come out. The block is easy to make providing that you ensure you keep to a ¼ inch seam allowance. Once the blades had been stitched together I backed the block with some plain White cotton and with right sides together, stitched around the outside. 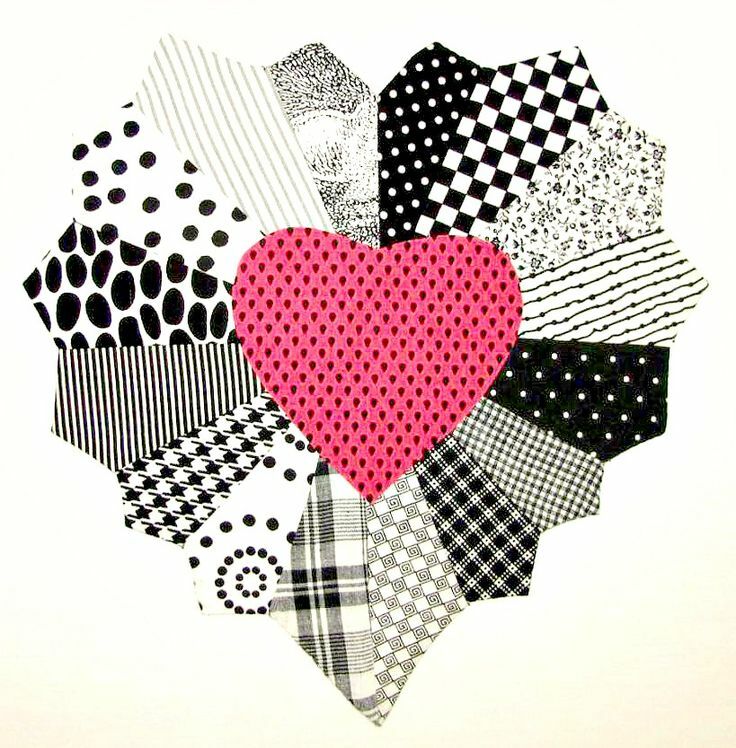 I turned through using the centre before applying the central heart motif. 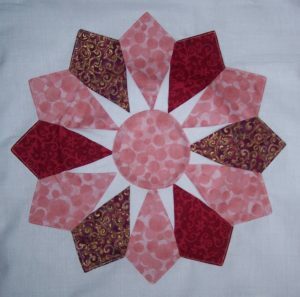 The block was then appliqued onto some plain Pink polyester cotton fabric. I used some bias binding to make the piping which I prefer to plain cushions. This cover has an envelope closure on the reverse. The finished cover is 15 inches square and has a 16 inch polyester-filled pad. I did say that I was hooked on this block. My sister, Catherine visited over the weekend and I took the opportunity to show her how to make this delightful design. 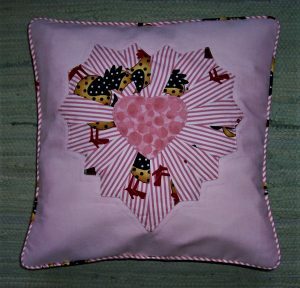 We chose a selection of Pink/Red cotton prints together with some plain White from my stash and got stitching! A couple of hours later we had a completed cushion cover with envelope back. Unfortunately, time was running short and we did not have sufficient time to insert a pad but Catherine has returned home with a set of templates and inspired to have a go herself. Next step is to make the heart-shaped Dresden, the pattern for which I found as a free download on the Craftsy.com website. I did say that I was hooked on this new (to me) patchwork block. Today I played around with some scraps and made a new peg bag. 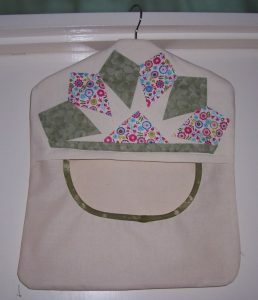 This project is also being promoted as a half-day class at New Threads Quilt Shop but before it is listed on the internet I need to make a ‘master’ version of the bag. I have learned quite a few tricks by making this one and I look forward to using it. I guess that once I have ‘finessed’ the design it will be a useful project to give as Christmas presents (oops there’s that C word again!). On Monday at the Franklins P&Q class we discovered the Dresden Plate block with a difference. Since the class I have trawled the internet and found several iterations of this style. I have never made a Dresden Plate block before but now I am hooked. You can expect to see many more – in fact I have even offered to tutor a class! This is my first attempt. 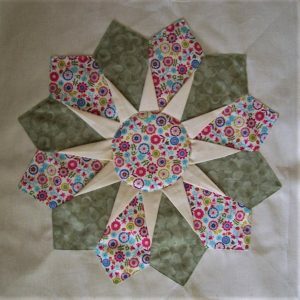 The outer ring of ‘blades’ is made using scraps from a previous quilt project. The central ‘star’ is in plain Calico. The block is applied to the backing fabric of plain Calico using a neat straight stitch. 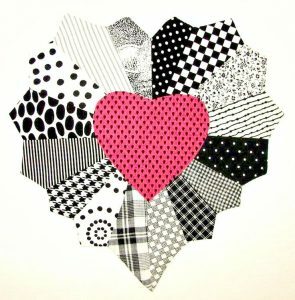 The centre circle of print fabric has been lightly padded before application. Next step is to pipe the cushion cover in the Green print and apply an envelope back. 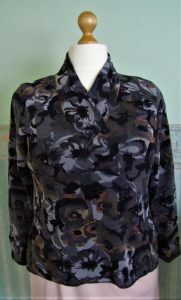 As mentioned at the end of my previous post, there was just enough fabric left over from Kwik Sew K3915 for me to squeeze out a Paolina top. By reducing the length of the sleeves and then adding a cuff I have even managed to get a long sleeved version. Other than that there is not a lot to say about this make. 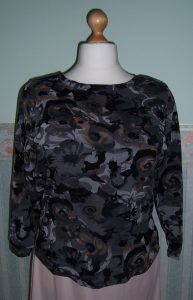 You have all seen the many, many Paolina tops that I have made. This Charcoal print will be ideal for the coming cold weather, worn with Grey Leggings or trousers and topped with a Grey print scarf. Having gone off plan, now I am continuing with making some samples for the workshops and classes that I will be tutoring in October through to Christmas. There I said it – Christmas is coming but I won't say any more until at least November! Back in the Summer (remember when the sun was shining?) my friend and I took a bus ride to the Goldhawk Road. We browsed several shops and bought 3 lengths of fabric. I have made up the 2 lengths that I purchased and since then this (3rd) length of Charcoal Grey printed jersey has sat in my stash waiting for the overlocker to be threaded up with dark thread. That day has dawned and so this morning I cut out version A of Kwik Sew K3915. I have previously made up this pattern in an ‘autumnal print’ for me but this version was to be for Adrienne. Stitching was fairly straightforward. I was prepared for the ‘fiddly’ part of the gathered collar which all comes together at a V-point. Again I have omitted the decorative fabric button loops and buttons – as far as I can see they really do not serve any purpose at all other than to add even more layers of fabric in an already ‘congested’ area! I was very pleased with the sleeve cuffs on the Elmira wrap cardigan and have therefore repeated this method on the sleeves of the top. Completion was with a simple hem of twin-needle stitching. 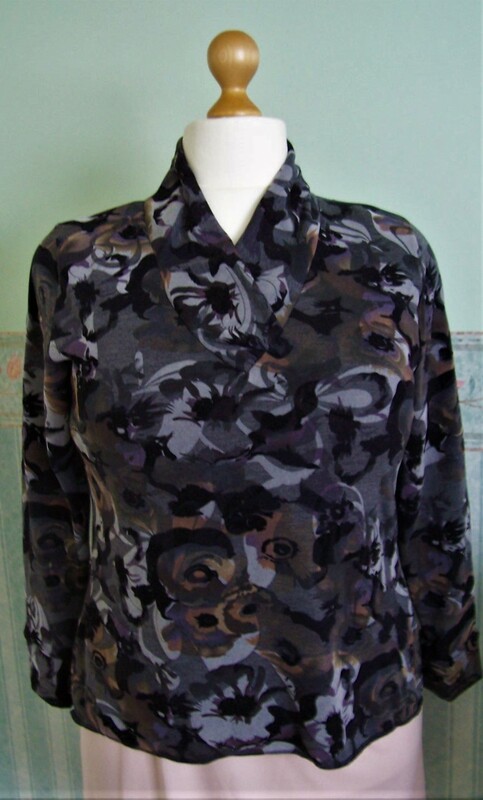 Adrienne purchased 2 metres of fabric and I was pleased to discover that there was sufficient left over to cut a Paolina top for me. Result! Fortunately as the fabric is a jersey, the top stretched to fit my mannequin but I hope that it also fits Adrienne! I know that I keep saying I will change the thread on my overlocker – well now I have. But, before I did so, I made yet another Paolina short sleeved top! 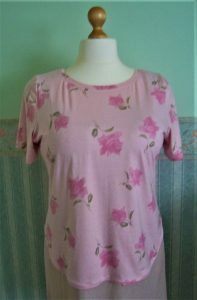 Those of you that read my blog on a regular basis will be well and truly sick of reading about this top but it is a quick, easy sew that takes just a bare 1 metre (in this case just 30 inches!) of wide width fabric. 30 inches was all that I had left after making the Elmira ballet wrap cardigan. Whilst the overlocker and sewing machine were both still threaded with appropriate coloured thread- why not finish using this pretty pink fabric with a top? There is really no more to be said regarding the construction. A very, very easy sew which would have been even quicker if the twin needle stitching had been better. I did manage to resolve the issue (sort of – that particular twin needle has now been disposed of) and now with the overlocker threaded up with Black thread it is onwards and upwards for Autumn sewing!